In this article, We will explain you about the autofs service and helps you to Automount Home Directories Over NFS in Linux. Autofs is a service offered us to automatically mount the filesystem when they need. It can also unmount the filesystem when not in use for a particular predefined timeout value. But there is an alternate method to mount NFS is using fstab which is well known method. 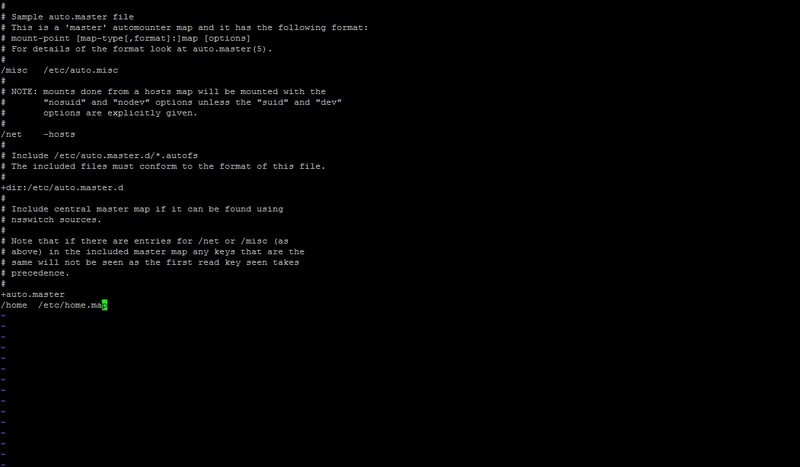 If you mount the filesystem using fstab, filesystem will be mounted automatically after the reboot. It doesn’t matter we use the filesystem or not. If you mount the NFS filesystem using autofs, filesystem will be mounted when someone is accessing it and automatically unmount when not in use after the timeout value. Best example for autofs is mounting the home directory shares over nfs for individual users when they log into the server. Main configuration file of autofs is /etc/auto.master. Each line specified in the master file defines a mount point and separate map file for each filesystems to be mounted. Each entry in auto.master has three fields. The first field is the mount point. The second field is the location of the map file. the third field can contain information such as a timeout value. It is optional. Assume that our NFS server hostname is "nfsserver" and sharing the folder "/home" over NFS. we have already discussed about Installing and Configuring the NFS Server on RHEL7/CentOS7 and also How to Create a LDAP Users and Groups using LDIF file, so we will not discuss those topics here, please refer those links. Now Login into the client and follow the below steps. 1. Verify the autofs is installed and running. Yes, autofs is installed. Now go to the next step. 2. Append the master configuration file /etc/auto.master to specify the mount point and location of the map file. Where the /home directory acts as a home directory for all the NFS users on the client. 3. Create the map file home.map and add the below parameters. 4. Enable and Start the autofs service. 5. Login in with some user and verify the home directory contents. Thats all about Mounting NFS File Systems using autofs.